For quite some time now I’ve used and enjoyed Philip Brown’s JDrill. It’s a nifty Java program that lets me practice/learn/remember Japanese Kanji characters. I keep a shortcut to it on all my monitors. 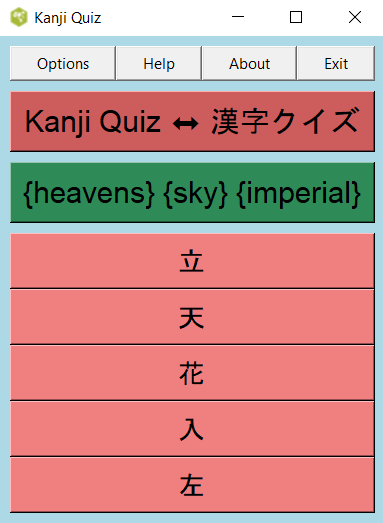 This little program has a limited set of features: it can randomly post a Kanji character and five possible English matches (one of which is correct) or v/v – an English quiz word and five Kanji “guesses”. Clicking on a wrong guess turns it red. Clicking on the correct match turns it green and in a few seconds a new quiz is presented. Clicking on the quiz word will “cheat”; the correct answer will turn green. 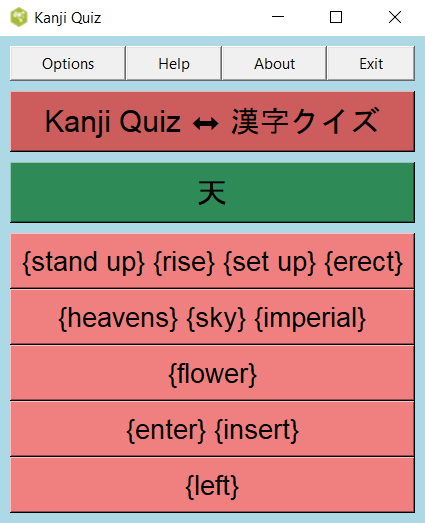 Clicking on the top “Kanji Quiz…” button toggles between Kanji and English quiz words. Multiple grades of Kanji can be selected – one or more – with grade 1 the easiest and “ungraded” the hardest. KanjiQuiz-x.y.x.zip: the original tcl program zipped up with the dictionaries as separate files. 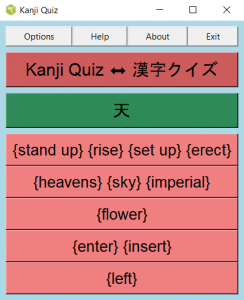 KanjiQuiz-x.y.z.apk: an Android app built with Androwish which also includes the dictionaries. Since -0.8.4 the apk is built for an ARM CPU target, which should run on most ARM and X86 devices. A note about the apk: this is very much a work in progress – and a hobby shop deal… The apk seems fine on my Lenovo Yoga 3 Pro tablet. It will install on my Samsung Galaxy S7 phone, and sort of works. It’s too large, and pinch-to-shrink isn’t available. I’m going to continue to work on it – but it (and the other versions…) are strictly amateur productions. Update 2018.10.13: There’s a -0.8.5a version out there now with font sizes appropriate for my S7. Still need to implement (or enable) panning to make it fully usable. Update 2018.10.17: Version 0.8.6a has a re-worked line wrap algorithm that lets things fit on my S7 ( 1440 x 2560 display ) in portrait mode. Seems usable without panning. The tcl version requires that the dictionary files be present in the same directory as the .tcl file. Download the KanjiQuiz-x.y.z .zip file and extract it. The resulting folder contains the tcl program and the dictionary files (the …xList files) . The exe and apk versions include the dictionaries and can be run stand-alone. If the preference is to run the native tcl program in Windows or Linux a tcl/tk interpreter will be required. Most Linux distros will include tcl and tk – either already installed or readily available in package repositories. For Windows, Active State’s Free Community Edition is available. At this time there’s no provision for saving preferences. That’s on the TODO list, along with adding a Hiragana option. Nice simple tool, good flashcard tester. The one thing I’d really love is a hirigana pronunciation for the kanji, not just the meaning. As far as saving options goes, I have a simple package that does that, creating a .ini file with key=value pairs. You can take a look at it here (https://github.com/theerik/PrefMgr); feel free to ask questions. I agree that some kind of pronunciation guide would help. For me, since my little bit of Japanese is spoken only (so far…) romaji would be really nice, but that’s not part of the available dictionary files. Will have to finally learn hiragana I guess. Romaji pronunciation guides only work if you know how to pronounce the romaji like a japanese speaker. 🙂 (No vowel diphthongs or consonant clusters.) I also struggle with hirigana; I learned it for a trip a decade ago and only remember fragments, but it has the benefit that it’s impossible to accidentally pronouce as if it were English. Back to add that Phil Brown’s JDrill – the inspiration for this project and linked in the article – has a Kana option. Have you taken a look at that?